Mr. T Game: An Exciting Race Against Time | It's time to go to MARS and do so as FRIENDS! This weekend Donny, Scott and I organized a little game night. 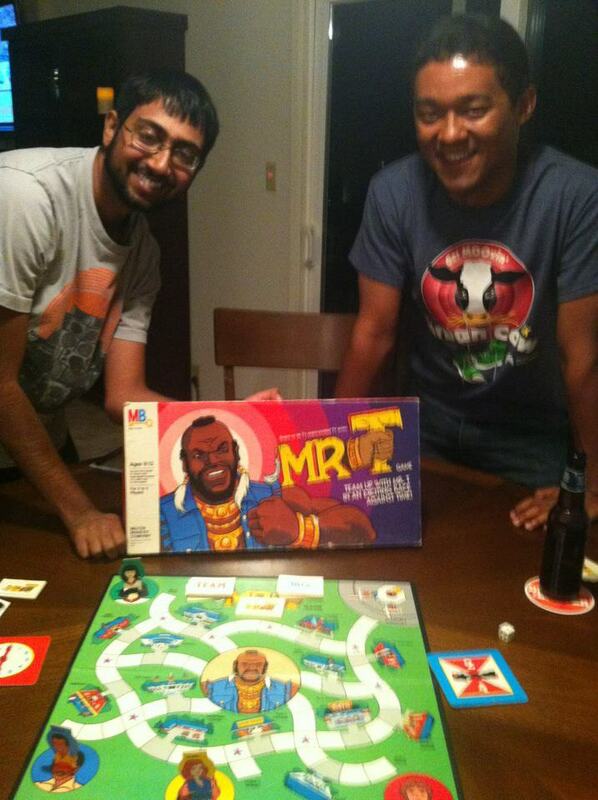 One of the games that we played was the Mr. T Game. The game is based off of the “80s cartoon series. The show follows Mr. T and a gymnastics team as they go around the world solving mysteries in their team bus, akin to Scooby-Doo. 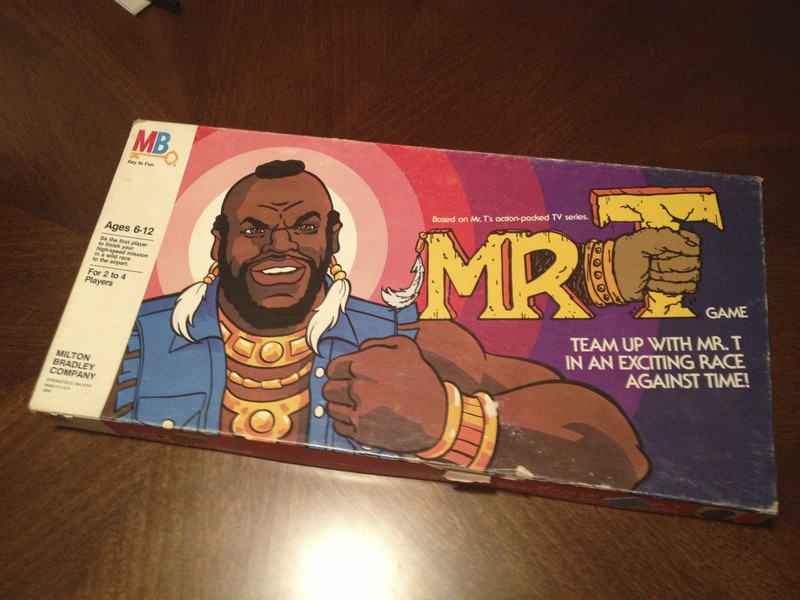 The show focuses on Mr. T and 4 gymnasts (Jeff, Woody, Robin and Kim), which are the playable characters in the game. Movement: There is a spinner with 4 numbers (2-5) which is spun to determine how many spaces you can move and the bus can move. Time Keeping: A spinner resembling a clock-face. After each round of play the arrow moves up 1 number or 5 minutes, totally for 12 rounds maximum. Mr.T Cards: These are chore cards, which direct you to visit specific locations on the board. Team Cards: Cards drawn when player lands on a red star. Analogous to Chance or Communty chest cards in Monopoly, which can help or hinder your progress. Bus Cards: Cards drawn when the bus token lands on star. Analogous to Chance or Community Chest cards in Monopoly, which can help or hinder your progress. Bus: A token that players can jump on to ride around the board faster. The bus token is moved by each player. 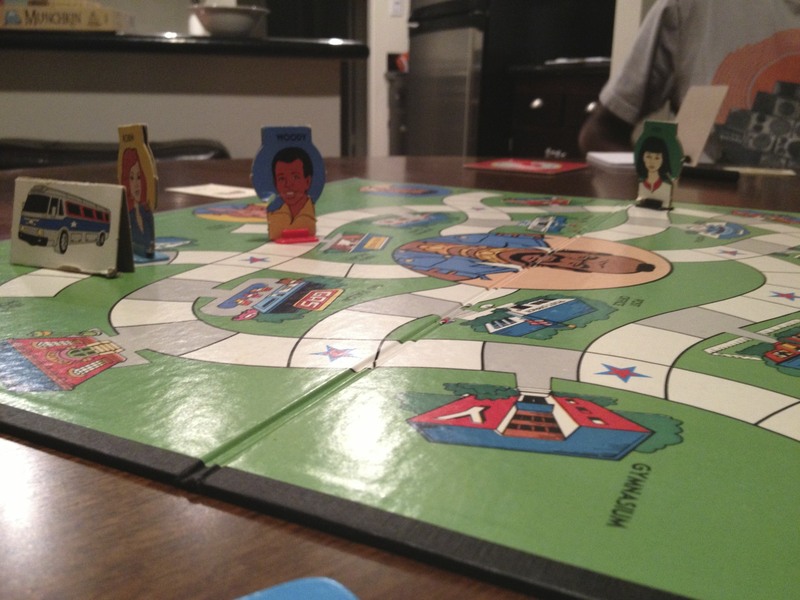 Each player starts off in their home and the Bus starts in the center of the board. Each player uses the movement spinner to determine the number of spaces they can move. If a player intersects the bus before completing their movement, they can stop their turn and jump on the bus. After the player movement finishes, they multiply the number on the spinner by 2 to determine the movement bus. 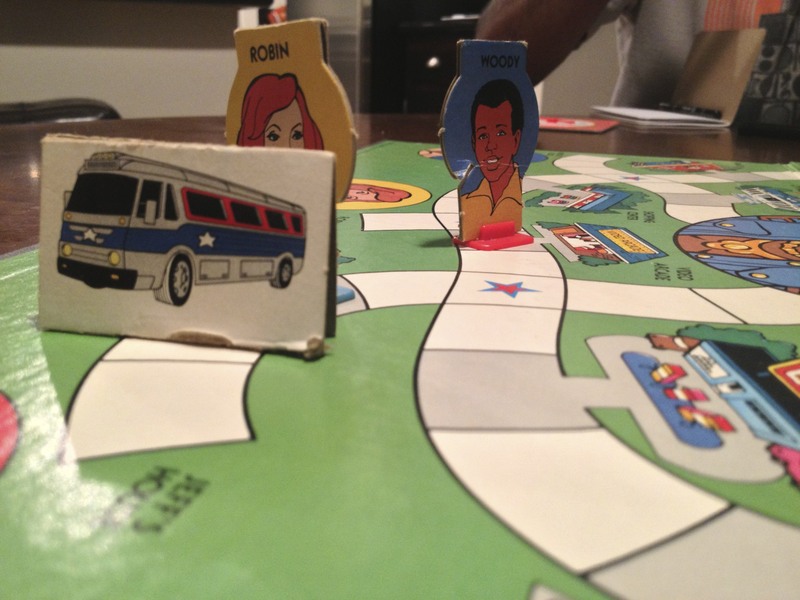 Players and Bus tokens can only move in 1 direction and can”t back track unless they come to the end of a path. If the Bus lands on the same space as the character of the current player, they may jump on the bus. The current player may disembark from the bus anywhere along the route for that turn, and the bus will continue to finish its movement. To complete a chore, the character must land on the exact space in front of the building the chore is to be completed at. At the end of each round of play, each player has 1 turn, the Time spinner is advanced 5 minutes. After the arrow on the Time spinner reaches 12 the game ends. The first player to complete all of their chores and reach the airport before time runs out wins. If time runs out, the player that has completed the most chores wins. If time runs out and more than 1 player is tied for completing the most chores, the player closest the airport wins. This game was surprisingly fun and complicated. The limited movement of 2-5 spaces without the bus coupled with the inability to reverse direction mid-turn, required players to think about the paths they took to complete their chores. The movement mechanism of the Bus made you think twice if the increase in speed and freedom to stop where you wanted was worth being at the mercy of other players. We quickly came to the realization that 12 turns was not many at all and that we were lucky if we got all 12 by the end of the game. There were cards that speed up the clock and reduced the total number of turns for all players. Also, there were cards that made you start from home base or lose an individual turn. With the bad came the good, as there were cards that helped speed you to your destination. 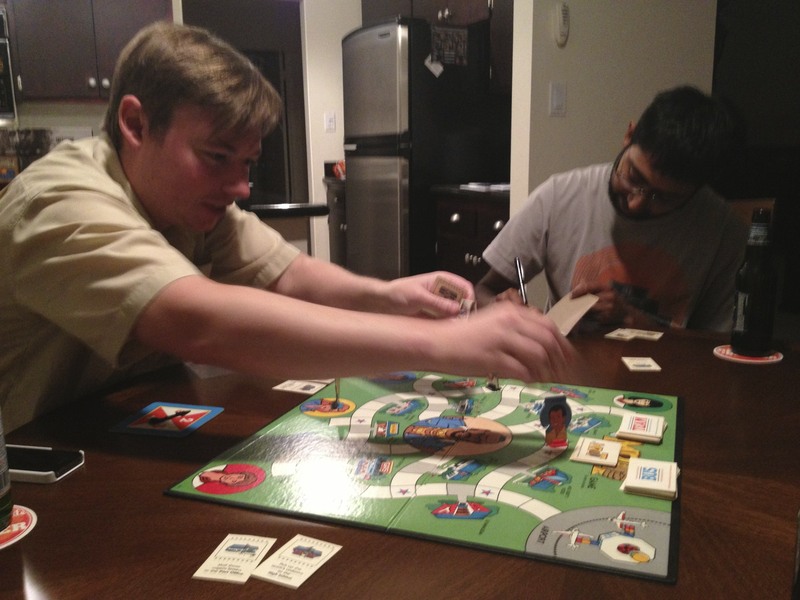 As advertised, this game was “An Exciting Race Against Time”. You guys have to bring this to the harvest festival. Pingback: The Walking Dead Board Game: Zombie Killing Time | It's time to go to MARS!